To Download the PDF of this Poster, click Here. Sun Tzu makes the point that you can be defeated if your defense is not good enough, if your armor, if you will, your sword play, is not up to the challenge. That is why we practice Defense in Karate so much first. It is primary. He also points out the victory is impossible if you do not attack. Practically speaking, this is a good example of how to defend yourself in a situation where it has gotten out of hand, or in sport where victory means the defeat for the other. This is why you need to practice attacking as you counter. This should be accomplished in Self Defense, Sparring, and even in forms if you are practicing with victory in mind. 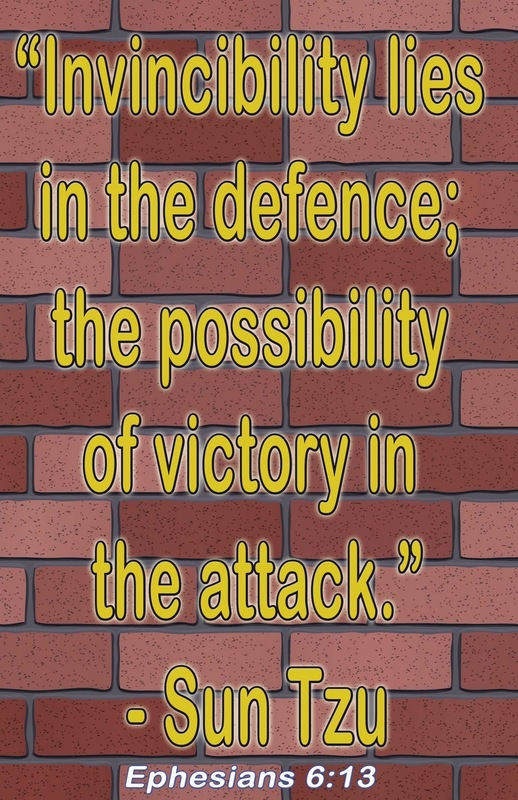 However, it is possible to win with defense alone, if you define victory as not getting hurt, or your opponent is a fool and give up or destroys him or herself in the attack. Sun Tsu's most famous works is the Art of War, and it has been used and taught in military academies since the 6th Century BC, and is reputed to be the most successful book on Military Strategy that has even been written. If you are a serious martial artist, this is one book you really need to own.